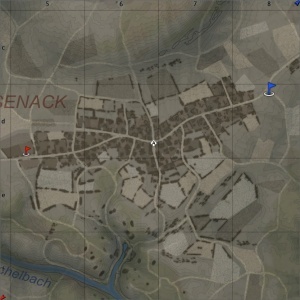 Battle of Hürtgen Forest is a ground forces map available in all modes. It was added in Update 1.49 "Weapons of Victory. 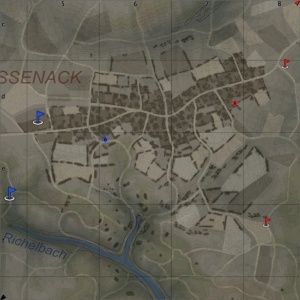 As the name suggests the map is set in the Hürtgen Forest; a roughly 50 square miles (130 km2) in area in the west of Germany, near the Belgium-Germany border. 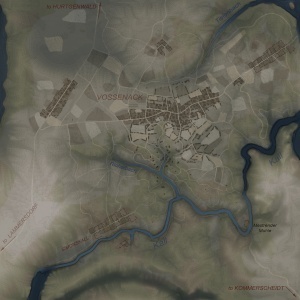 The map itself is an accurate representation of the town of Vossenack, located in the south-west of the forest. 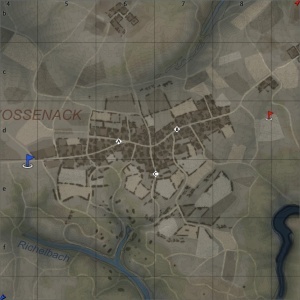 The map in game has three main areas; in the middle of the map is the main town of Vossenack. The town has a single road running east to west through it, with small streets branching off of it. The town consists almost entirely of destroyed houses, with only a handful of undamaged buildings. Tanks fight in the streets of the town, and round the back of the buildings, using them for cover. In the center of the town, there is a destroyed church. North of the main town there is a valley, with a large hill on the other side. On the top of the hill there is a small settlement with a windmill and several destroyed buildings. Players on the hill can shoot across the valley to pick off tanks fighting in the north of the town. South of the town the terrain becomes more hilly. There is a small gorge, with rocky cliffs on each side, and the river Kall to the south. Teams trade shots from the cliffs on each side of the gorge, with some tanks venturing down the paths into the gorge; either to capture a the point that is sometimes located there, or to advance up to the other team's side of the gorge and engage them on the cliffs. 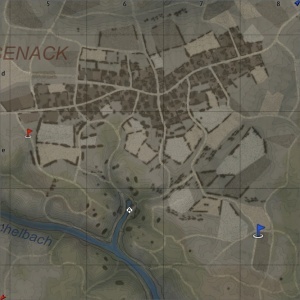 Players can flank the enemy team by advancing around the north gorge, through the south of the town, and engaging them from the side. Alternatively tanks can go south, either following the river into the gorge, or use the southern river bank to flank the enemy tanks on the cliffs. The area to the south o the river Kall is extremely hilly and densely forested, with steep paths and concrete fortifications. 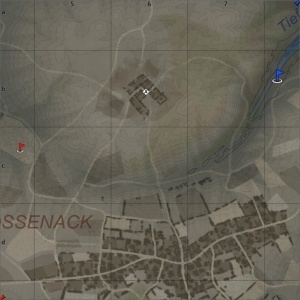 The tank battles map is 4km x 4km (although the battle area can be restricted to less than that) and the air battles are is 64km x 64km. Teams fight for control over a strategically important point located in Hürtgen Forest. The Battle of Hürtgen Forest was a series of fierce battles fought from 19 September to 16 December 1944 between American and German forces, it was the longest battle on German ground during World War II, and is the longest single battle the U.S. Army has ever fought. The American Forces hoped to pin down German forces in the area to keep them from reinforcing the front lines farther north in the Battle of Aachen; and later advance from the forest, and down the Ruhr river. The Germans fiercely defended the area because it served as a staging area for the planned counter attack in the Ardennes. Ultimately the Allies failed to capture the area after suffering several heavy setbacks and German forces were able to successfully hold the region until they launched their counter-attack through the Ardennes (which became known as the Battle of the Bulge), ending the Hürtgen offensive. The Allies suffered over 33,000 casualties during the failed attack and the Germans suffered 28,000 in the defense. Following the failed German counter attack in the Ardennes, in early February 1945 American forces attacked through the Hürtgen Forest again; breaking through the severely weakened German defense and advancing into the Ruhr valley. In the in-game map the church in the town is largely destroyed, in real life this was the result of a group of M4 Sherman tanks firing into the Church to kill snipers believed to be hiding in the church's Belfry. There are three Capture Points. A is on the left portion of the town, B is on the right portion of the town, and C is in south of the town. There are four configurations of the conquest mode, each with one Capture Point. In Conquest #1 the capture point is in the gorge, in the south. In Conquest #2 the capture point is next to the church, at the main cross roads in the town. In Conquest #3 the capture point is in the small settlement on top of the north hill. 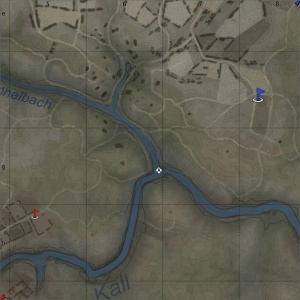 In Conquest #4 the capture point is at a fork in the river Kall, in the south of the map. There are two capture points, each belonging to a team. Point A is in the west of the town, and point B is in the east of the town. This page was last edited on 7 March 2019, at 16:48.